Andrea Bruce, "Uncovering the Sadness of Young Deaths"
A photo essay by Andrea Bruce for the NY Times, on infant deaths in Afghanistan. The chiaroscuro lighting she uses (or finds naturally, in huts with small windows) links her to Renaissance religious painters like Caravaggio. An ugly subject like a dead child in a poor country is made beautiful and tragic. Read the whole Times story on Bruce's photo essay. There are 12 photos you should see, and info on how you can help. 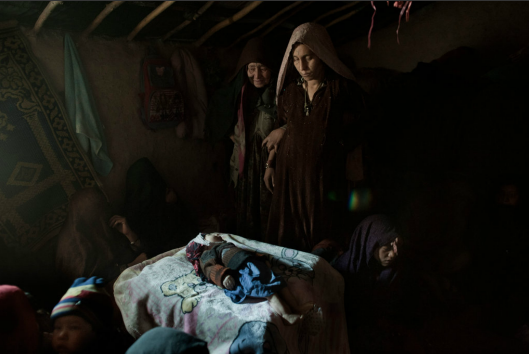 The Times has some great women photographing in war zones, particularly Lynsey Addario.